We all know about the more popular subscription boxes, and I’m pretty sure most of my friends are signed up to some kind of beauty or food subscription box. However, wouldn’t it be nice to have a monthly present that is something you can use every single day? Not something that can only be used or eaten once, but rather something of quality that you can continue to use again and again? Well… that’s exactly what the Anonymous Jewellery Subscription Box is for! For just £10.90 per month, you can receive a mystery box of 2, 3 or 4 products – picked out just for you depending on your answers in the initial questionnaire when you signed up! Never wear gold? Let them know and you’ll never receive a piece of jewellery that is useless to you! 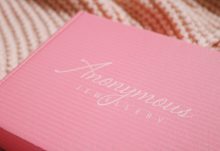 What I love most about the Anonymous Jewellery subscription box is the fact that it can be suitable for everyone – whether your jewellery collection is worth your weight, or if you only have a few pieces and are only just beginning to think of expanding your collection – you’re sure to just love the versatile pieces you’re going to receive! Plus, what better surprise for your letterbox every month than surprise jewellery?! Like a little present from yourself, to yourself, every month. Because you’re awesome and you deserve it! Before we get onto the actual jewellery pieces that I was lucky enough to receive in the May Anonymous Jewellery box, I just wanted to mention a couple of extra little bits that came in the box, which for me made the box that extra little bit special. 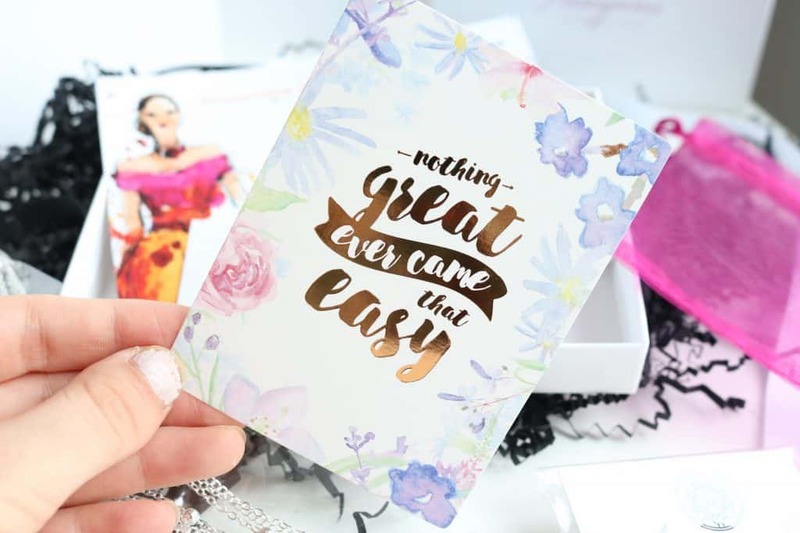 First of all was a small, floral print, with a rather inspirational quote: Nothing great ever came that easy. It’s a little larger than a credit card, and printed on card, and the gold quote is actually embossed – it’s just so pretty! I’ve propped it up on my desk as a little daily reminder to keep grinding, even if you feel yourself getting into a rut! Okay so…. hands up who doesn’t wash their makeup brushes as much as they should? I know I definitely don’t do this as much as I should do. Guess what else I never do… look after my jewellery! 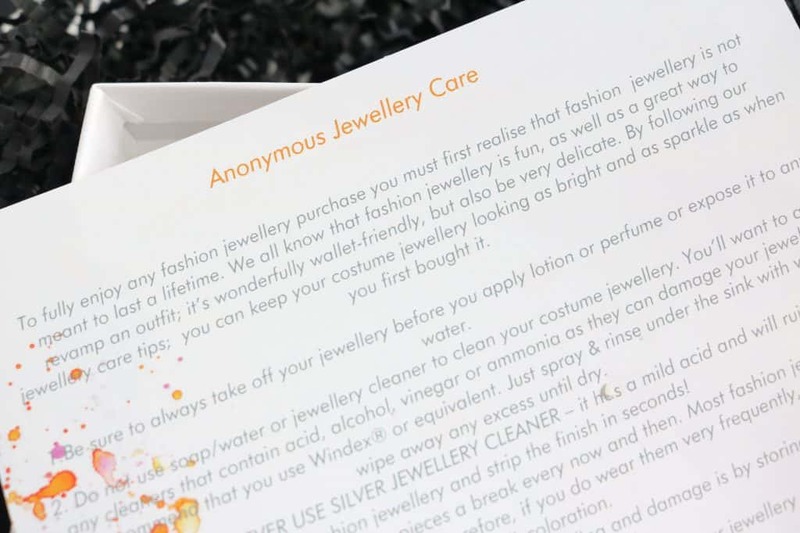 Anonymous Jewellery put a little slip in the box, explaining their care tips to ensure your jewellery keeps in tip top condition for as long as possible. They do make mention to the fact that the jewellery provided in the box is costume jewellery – it’s not going to be Tiffany quality, nor is it going to last decades and be passed down as a family hierloom. (Note: don’t use silver jewellery cleaner on costume jewellery. If it’s not pure silver, you’re going to ruin the finish!). Don’t sleep in your jewellery. Store it properly in a soft pouch. Don’t wear it every day for a year straight and then be disappointed that it’s tarnished. Look after your costume jewellery, and it’ll serve you well! Now… on to the most exciting part! What did I receive in the Anonymous Jewellery Subscription Box?! The first piece that caught my eye was this beautiful choker. Chokers are so fashionable at the moment, and I really don’t see that trend going anywhere anytime soon. The soft, black, suede of the necklace is comfortable, delicate and flexible – it won’t hold shape, so if you wrap it round your neck three times on one wear and only once the next, it’s not going to kink like cheaper varieties can do. The faux stone at the end of each end of the choker is marbled and really pretty – I’ve had many a compliment when wearing this! What I love most about this piece is the versatility of it – smart enough to wear to work, but also looks great with a dress on a night out! The next piece of jewellery that stood out to me was this beautiful silver layered necklace. The rose quartz stone looks so much more expensive than it actually is, and the layering of the necklace makes a simple piece much more interesting. The necklace doesn’t hang too long, meaning there isn’t any awkward ‘it’s falling in my cleavage!’ moments if you’re wearing a V neck top. The delicate stars and moons on the layers make the whole necklace that little bit more mystical. The final piece of jewellery in my box were these elegant earrings. I love a classic pearl, and thrown in with the very much on-trend geometric design hanging below, these earrings look luxe and unique. Again, I’ve had SO many compliments when wearing these earrings! They’re statement enough that you don’t need to over do it with a big necklace as well – let the earrings be centre stage and pair them with simple, delicate jewellery. 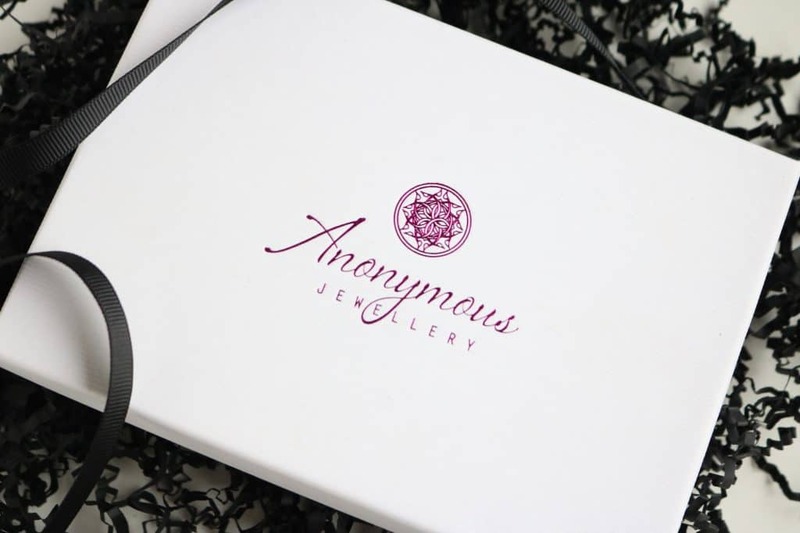 Anonymous Jewellery is a fantastic way of adding versatility to your ever growing jewellery collection. Keep in the know of the changing fashion trends without even trying! The great quality and design of the jewellery won't disappoint. 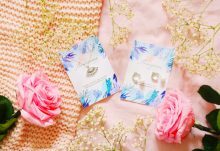 I cannot recommend this subscription box enough for anybody who wears jewellery and would like a little monthly present to put a smile on their face!